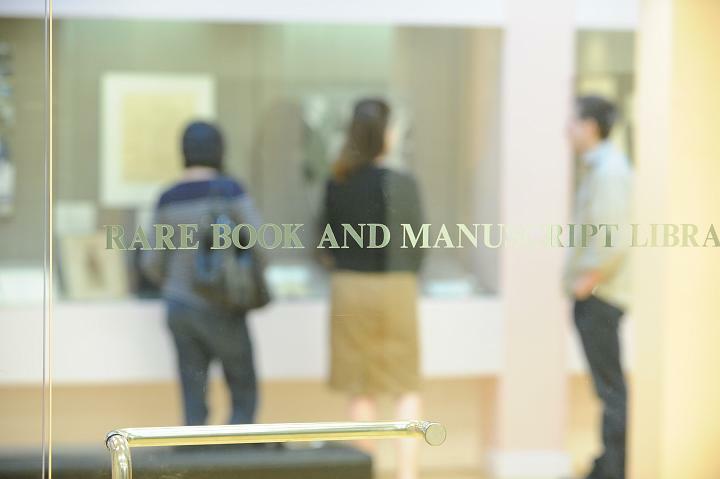 Interesting narratives that are interwoven into Columbia University’s history can unravel simply by creating an online inventory for a collection. 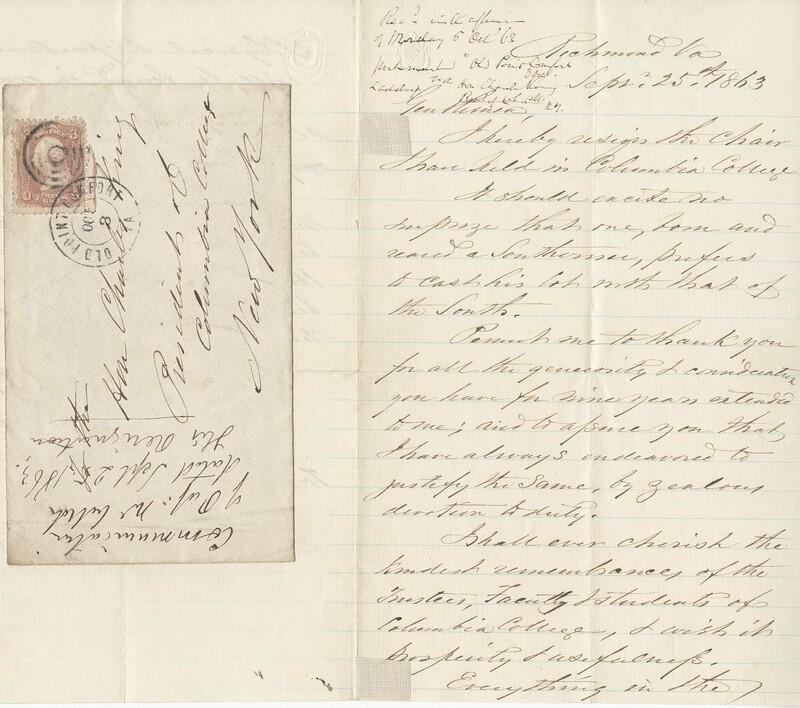 Recently, a series of letters was discovered within the Columbia College Papers that elucidate past events involving administrative prejudice, academic politics, and the Civil War. 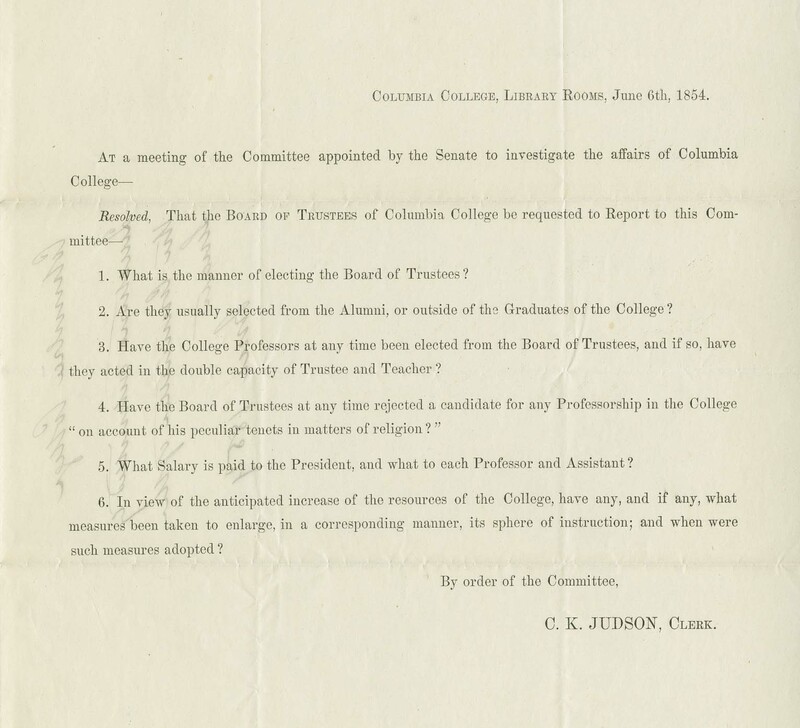 United States Senate that was investigating whether or not Columbia’s Board of Trustees violated anti-discriminatory terms within the charter. 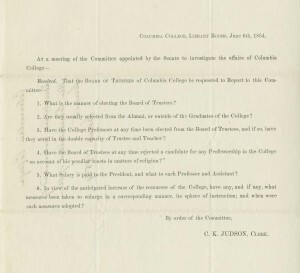 The Senate committee asked a broad series of questions regarding the hiring practices of the Board of Trustees, one of which asked if the board has ever rejected a candidate “on account of his peculiar tenets in matters of religion?”. The Board of Trustees invoked their Fifth Amendment rights for this question and the committee concluded that although individual board members may have violated charter’s terms, the Board of Trustees as a whole was not guilty. McCulloh left New York for Richmond, Virginia where he became a consulting chemist for the Confederate Nitre and Mining Bureau. The Board of Trustees initially acknowledged his resignation in correspondence with colleagues, but McCulloh’s decision to join the Confederacy prompted them to expel him from the faculty, as noted in the Board Minutes, rather than officially accepting the resignation. McCulloh went on to develop a lethal chemical gas for the Confederate Army, which was never used in combat. After his subsequent imprisonment he became a Professor of Mechanics and Thermodynamics at Washington College, where Robert E. Lee served as President, until 1878. 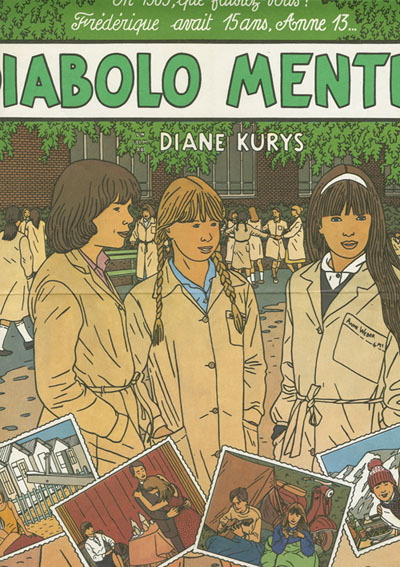 This rich story, spanning the course of a decade, was unearthed in a collection that holds countless narratives waiting to be told. 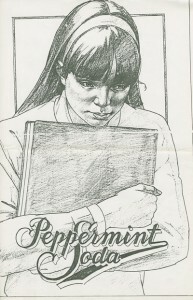 An inventory of the Columbia College Papers will be made available online in the near future. 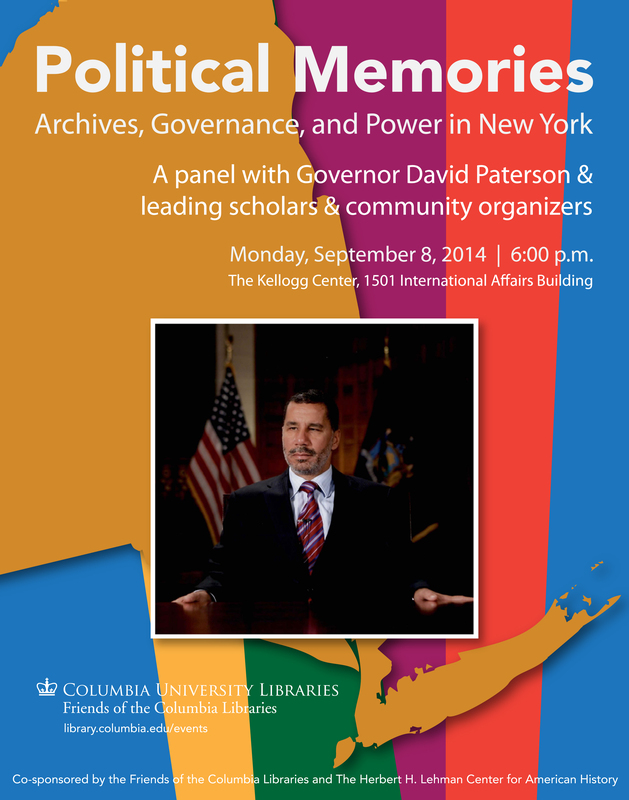 This entry was posted in American History Collections, Columbia University Archives and tagged Archives, Columbia University, Rare Book and Manuscript Library, University Archives on November 4, 2014 by jkw19. 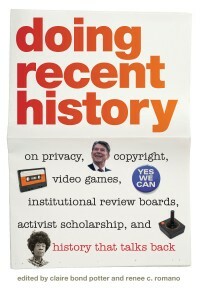 Jim Neal, Columbia University Librarian. Dr. Khalil Muhammad, Director, Schomburg Center for Research in Black Culture. Ester Fuchs, Professor of International and Public Affairs and Political Science, SIPA. Peggy Shepard, founder director of West Harlem Environmental Action. 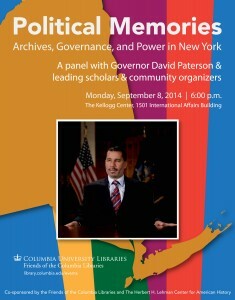 Monday, Sept. 8, 2014, 6pm. 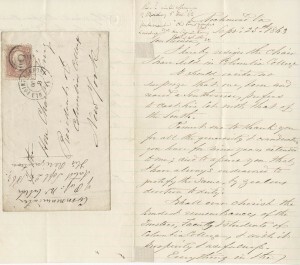 This entry was posted in American History Collections, News & Events and tagged African-American History, Archives, New York, Rare Book and Manuscript Library on August 25, 2014 by Thai Jones. One thing that is striking upon processing the Dan Talbot Papers is the types of materials his company kept and the attention to detail each film was given. When I think about the functions of film distribution companies my immediate thoughts are acquiring, distributing, and publicizing. 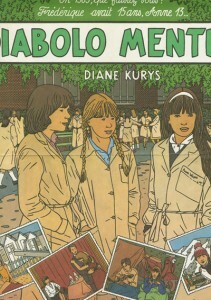 Talbot’s New Yorker Films seemed to go above and beyond what was required for such a small independent film company. With a staff of just nine individuals (according to a quick internet search) the amount of material within the Dan Talbot Papers surrounding New Yorker Films is astounding. The collection spans over 500 boxes and includes a variety of materials from printed and audiovisual material to operations files. The most surprising files I’ve found have been the reviews of each film Talbot’s company distributed. 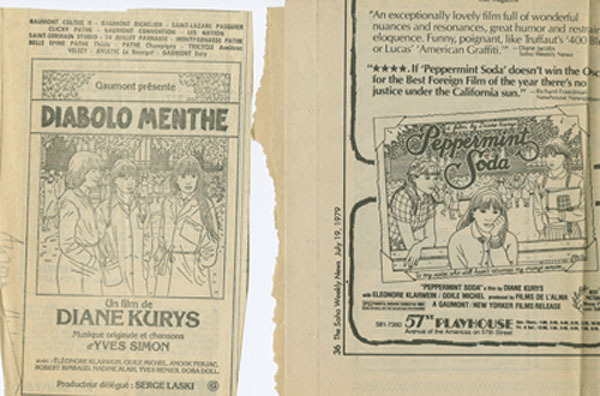 Not only does the collection contain both original newspaper clippings as well as copies but these reviews are sometimes broken down by region (for example East Coast and West Coast reviews) and sometimes even more specifically by state. I’ve never considered how much importance a film distribution company would place on film reviews. It seems a little odd to me to collect nearly everything written about the film. As a matter of practice, you would think a film company would care more about how much money the film is making rather than whether or not it is being favorably received. Perhaps it was Talbot’s own history as a former film critic (he wrote for The New York Times in the 1960 as well as The Progressive) as well as his nature as a cinephile that made him want to read and save pages upon pages of reviews. 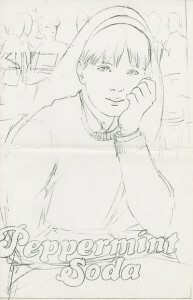 I was also surprised at the detailed marketing attention some of the films in his distribution company received. While it is entirely common for film companies to put together press kits of film synopses and photographs in order to send out to the media, it is quite another to be engaging in the creation of original artwork for the films. 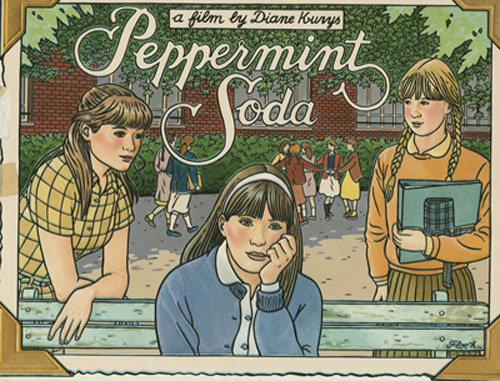 The film Peppermint Soda, a 1977 coming of age French film, directed by Diane Kurys and distributed by New Yorker Films, features some incredibly stunning hand drawn art, from full posters and transparencies to individual prints. 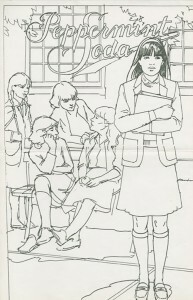 The above poster and transparency for the film were created by Floc’h, a French artist who previously collaborated with director Jacques Rivette. It is likely he’d already provided his services prior to Talbot’s acquisition of the title, as Gaumont films originally had the rights to the film. Regardless, the detail in marketing and publicity for Peppermint Soda is so specific to the film’s content and genre and was clearly given a lot of time and focus after Talbot’s acquisition of the title. 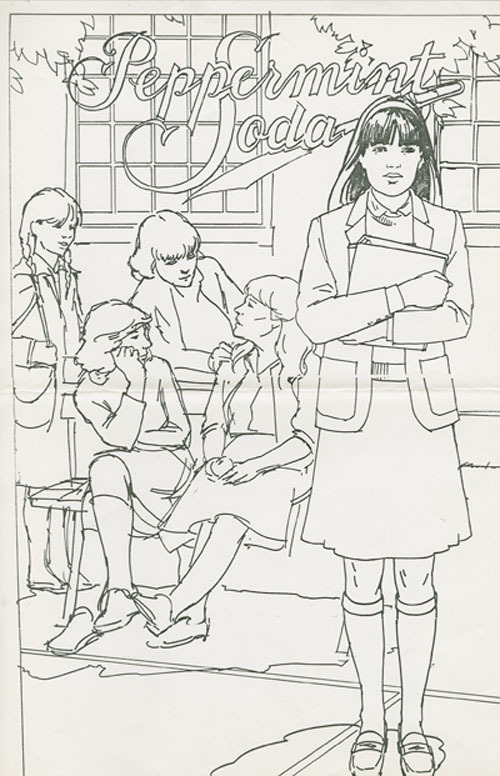 Many files within the Dan Talbot Papers contain ads for films. These would appear in newspapers and magazines and are usually presented with quotes. They are normally stills from the film. 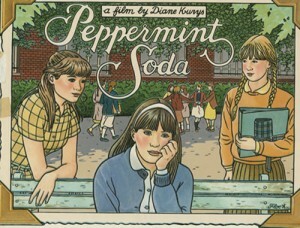 The ads for Peppermint Soda, however, contain original 8 1/2 by 11 hand drawn black and white illustrations, based upon scenes in the film. 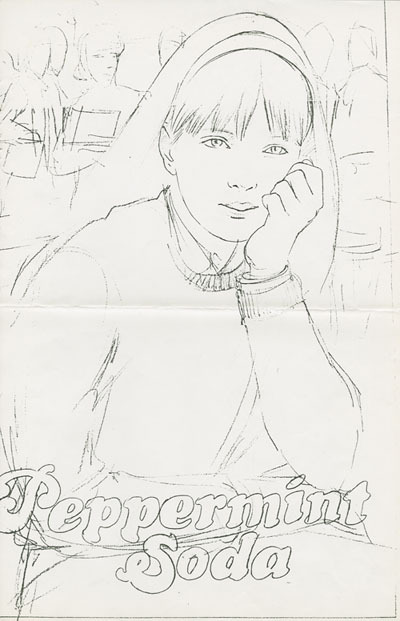 Some of this artwork was then set within print newspaper ads. From my experience processing thus far, it appears that Talbot kept all the print ads to most of his films, from each publication they appeared in. The Dan Talbot Papers are not only a treasure trove of material from the independent and foreign film scene for cinephiles, researchers, and scholars alike but the collection also provides insight into the inner workings of an independent distribution company and just how far that role extends. This entry was posted in Performing Arts Collections and tagged Archives, Dan Talbot, Film, Finds!, Rare Book and Manuscript Library on December 10, 2013 by Adrien Hilton. It’s the guest books section of the collection that I’ve chosen to focus on first. 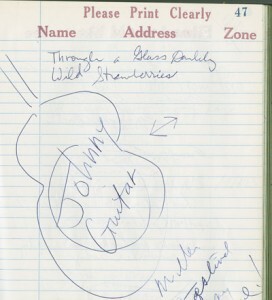 These guest books are from Talbot’s New Yorker Theater which was operational from 1960 to 1973. The New Yorker Theater was an art house cinema that screened classic and foreign films, as well as Independent and avant-garde films of the day. The theater was the first of its kind to hit New York City and provided an outlet for many up and coming filmmakers such as Woody Allen and Martin Scorsese as well as notable film critics such as Susan Sontag and Andrew Sarris. 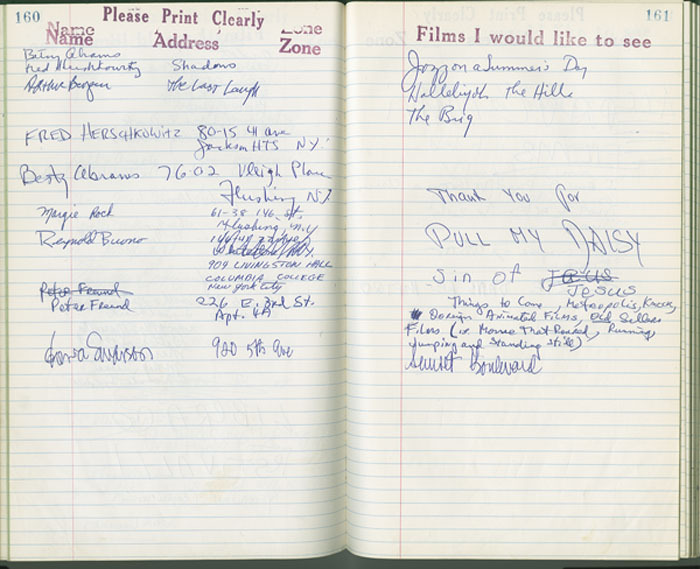 Talbot established the use of guest books in his cinema so that patrons could state what they’d be interested in seeing. 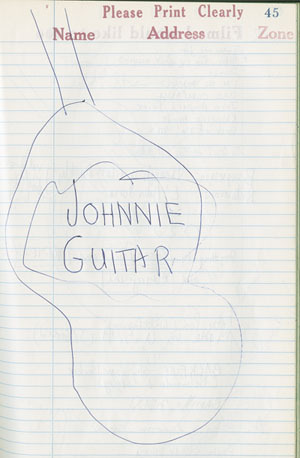 The guest books yielded a variety of responses — from a few overzealous viewers who decided to draw guitars as their way of saying they’d like to see the Nicholas Ray film Johnny Guitar, to the cinephiles who take up an entire page with a few films titles because they were just that passionate. Some patrons didn’t leave their names; others did. A few notable individuals who attended the theater and suggested what they’d like to see were none other than Gene Wilder and Martin Scorsese. There is also an entry written by Gloria Swanson, and if it really was the classic actress then narcissism was rearing its head as her chosen film was — wait for it — Sunset Boulevard. While it’s likely this amusing entry, complete with an address, was Swanson, there were quite a few patrons who did enjoy pretending to be people they were not. 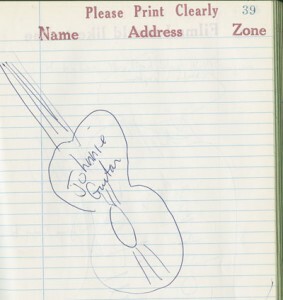 A few imposters spotted amongst the guest books included Groucho Marx, Judy Garland and Orson Welles. The idea of guest books at a theater seems completely foreign to me today. We go to the movies and see what is offered because the majority of the movie-going public attends mainstream movie houses. 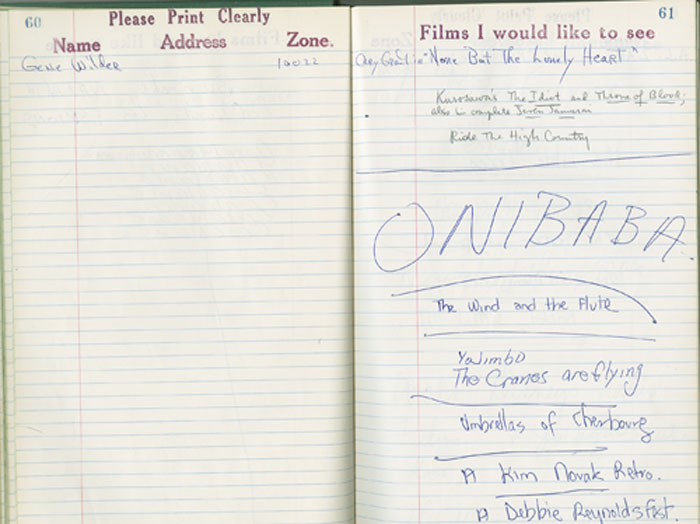 Talbot utilized the guest book as a way of sussing out what his audience was really interested in and attempting to obtain those films because his goal was to bring Art House cinema to the foreground. However, it was not always easy. Talbot’s own difficulty at obtaining foreign titles to screen at his theater was the catalyst that lead him to found New Yorker Films in the first place, in 1965. The New Yorker Theater is no longer around and what we have left is several dozen guest books encapsulating a period of time that had New Yorkers excited and hungry for art and culture. Art House theaters do still exist, especially in the city. A notable one is the Film Forum, which showcases a variety of classic and foreign cinema and very often has retrospectives on certain genres or directors. Others include the Museum of Moving Image, the IFC Center, Landmark’s Sunshine Theaters and the Angelika Film Center. Each of these theaters screens a variety of classic and foreign film selections in addition to current independent cinema. Talbot and his wife now run Lincoln Plaza Cinemas. It’s a small theater and very close to the Lincoln Center Loews, yet offers a variety of films that are usually not shown there. When a film says it opens in limited release in New York and L.A., you can bet that Lincoln Plaza Cinemas is one of the theaters in New York to screen it. Having been at Lincoln Plaza Cinemas myself I did not see any guest books in the lobby. However, it would be wonderful to see the return of this outreach tool in one of these establishments to give cinephiles a voice for what they’d like to see. Dan Talbot had the right idea in the 1960’s with his New Yorker Theater and it was that cinema is a collaborative art between filmmakers, film distributors, and its patrons. This entry was posted in Performing Arts Collections and tagged Archives, Dan Talbot, Film, Finds!, Rare Book and Manuscript Library on November 25, 2013 by Adrien Hilton.